South Korean electronic manufacturer has just announced the Samsung Galaxy Tab S 10.5 which features an Amoled display with Corning Gorilla Glass and an Octacore CPU. 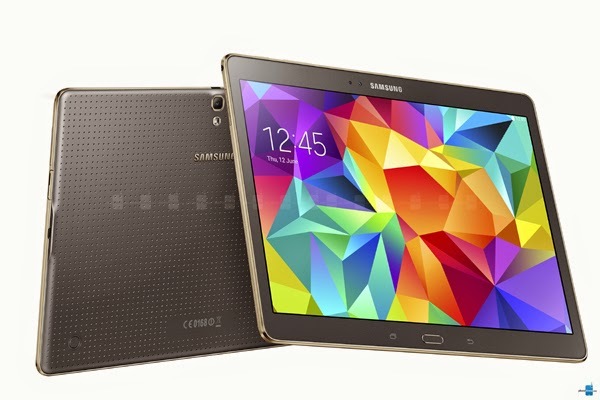 The Samsung Galaxy Tab S 10.5 has a Samsung Exynos 5420 octa core processor clocked at 1.9GHz with Mali-T628 MP6 GPU and 3 GB of RAM. It also has a 32 GB onboard storage that can be expand up to 128 GB via microSD, microSDHC and microSDXC. The new tablet equipped with 8 megapixel Auto Focus main camera with LED flash and a 2.1 megapixel on front. It supports 1080p HD video at 30 fps.